A busy Ian Baird is pleased to confirm former Manchester City, Bristol City and Swindon Town striker Lee Peacock has put pen to paper on a contract extension. The one year deal will see 35-year-old Lee remain at the Silverlake until the summer of 2013. Spitfires manager Ian Baird said: “Lee contributed well for us last season and has seen it and done it all before. Obviously players like Jack (Dovey) and alike are the long term future of the club but Lee’s role could be vital in our promotion quest. Eastleigh Football Club would like to confirm that talented 30-year-old goalkeeper Gareth Barfoot has rejected our contract offer and has agreed to join Southern League Premier club, AFC Totton. At this stage of his career the opportunity of first team football was the big attraction and he leaves with a big thank you and all of our best wishes. Ian Baird said of the Southampton born shot-stopper: “The second half of last year Gareth was an understudy to Jack, which is difficult for anyone to take, but he was never content to just sit on the bench. The signings just keep coming as we are delighted to announce the permanent addition of 19-year-old talented goalkeeper Jack Dovey. Former Southampton professional Jack is said to be thrilled to have finally concluded negotiations that will see him at the Silverlake for the next two years. Manager Ian Baird said: “Jack did well for us last year and if he continues to apply himself will no doubt have a big future in the game." Ian’s proven record selling players to the professional game was a major factor on securing his signature, he continued: “Negotiations have been going on for some time to say the least, but ultimately he was always desperate to sign for us and we were desperate for him to sign. Eastleigh Football Club are delighted to announce manager Ian Baird’s fifth summer signing today, securing the signature of high profile and gifted midfielder Jai Reason. 22-year-old Jai has agreed a two year deal at the Silverlake having recently declined a contract extension with Braintree Town who play in the Blue Square Conference Premier. Spitfire boss Ian Baird said: "Jai's arrival has been a long time coming as he was one of my main targets from day one - at 22 he is certainly one for the future as well as the here and now. Any player scoring 13 goals from midfield in the Blue Square Premier will be sought after. "He is exactly the calibre of player we are looking to attract. Next year's squad will need plenty of legs and a mixture of young and experienced players will hold the key". Eastleigh Football Club are excited to announce their pre-season games so far, which will see the Spitfires take on a range of opponents including mouth watering friendlies against newly promoted Premiership side Reading and League Two Oxford United’s first eleven. The action kicks off at the Silverlake with the Family Open Day on the 14th July 2012 for fans to meet and see the players train first hand and enjoy the entertainment provided by our various sponsors. Ian Baird will then take his team to Poole Town in mid-July for an away match, followed by another two away fixtures against Oxfordshire’s North Leigh and local rivals Sholing. AMBITIOUS Eastleigh have wrapped up their fourth close-season signing, striking a deal for pacy left winger Dale Binns from Woking. The Spitfires’ interest in the 31-year-old first came to light at the beginning of May when they announced his ‘move’ on the club website only to quickly withdraw it after the player had slammed them for jumping the gun while he was still under contract with Woking. But that contract has now expired and Binns was released by the Cards after helping them to a Blue Square Bet South/Surrey Senior Cup double. The London-born former Spurs youngster spent seven seasons with Hendon and moved on to Cambridge City and Stevenage Borough before becoming part of Lewes’s Conference South-winning side of 2007/08. After spells with Maidenhead and Hayes & Yeading, he was reunited with his old Lewes boss Steve King at Farnborough, who finished Conference South runners-up and beaten play-off finalists in 2009/10. Eastleigh FC Ltd are delighted to announce the signing of Dale Binns from newly promoted Woking as boss Ian Baird continues to strengthen his squad for next season. 30 year old Binns, a pacy left-sided player has now fully completed all the usual paperwork and signs for the Spitfires initially on a one-year deal. Ian Baird commented "I am delighted to have been able to attract Dale to the club, he is a quality player who can play anywhere down the left side and will add genuine pace to the squad. He wants to be a part of what we are trying to achieve at the club and although a little way off, he like everybody else is eager to get the new season off and running." Binns started his footballing career with Tottenham Hotspur before enjoying a long and successful spell at Hendon where he played over 200 games, scoring 41 times, before joining Conference South outfit, Cambridge City in 2004. Eastleigh Football Club are delighted to announce their first ever Family Open Day which will be held on the 14th July 2012. The Open Day promises to be a great event with fans able to meet the full first team, see an open training session and have unlimited access to the stadium. They will also have their chance to get a photograph with the Hampshire Cup – having recently secured the trophy from local rivals AFC Totton. In the heat of July (we hope!) this free event will have various stalls, music, bouncy castles and lots, lots more to enjoy - all provided by our various partners. It will also be your first opportunity to meet our new signings face to face. The Eastleigh FC Juniors will be officially launched as we look to attract the next generation of supporters to the Silverlake. They will have their own training session followed by a match against the first team, which should be the highlight of the day! CHRIS Flood hopes his virtuoso performance in the Hampshire Senior Cup final will be enough to keep him at the club next season. The 22-year-old, who has been placed on the transfer list, scored the opener and set up the second for Mitchell Nelson in the Spitfires' 2-0 win over Totton at St Mary's. After the match, Flood indicated he wants to stay at the Silverlake Stadium and help the club push for promotion into the Blue Square Premier. "I think I showed the fans that I want to be here next year, so I've got to wait and see what happens," he said. "I'm going to just work hard, that's all I can do. "I've done well tonight, so hopefully I can just build on that." Speaking of the atmosphere in the Eastleigh dressing room after the team's victory, Flood added: "It's really good. It's a great set of lads and that's another reason why I really want to stay." EASTLEIGH assistant boss Shaun Wilkinson hailed the club's historic achievement after they won their first ever Hampshire FA Senior Cup. Wilkinson was in charge at St Mary's last night, with manager Ian Baird in Hong Kong for the International Soccer Sevens tournament. Baird had accepted an invitation to take part in the event, thinking he would have the date free after the Spitfires were knocked out in the second round of the competition. But their opponents, Aldershot, were subsequently disqualified for fielding an ineligble player, granting Eastleigh a reprieve they took full advantage of. "I actually played in that Aldershot game - that's why we lost," said a delighted Wilkinson, as he laughed at the incredible turn of events. "I'm very pleased, it was a good professional performance from the lads and we did really well." Eastleigh FC completed their 2011/12 campaign with jubilant celebrations by lifting silverware after a Hampshire Cup Final victory over AFC Totton at St. Mary's Stadium. Shaun Wilkinson stepped in as manager for the evening in the absence of Spitfires boss Ian Baird, who is in Hong Kong and will no doubt be delighted with tonight's result on his return. Wilkinson was joined by Phil Pearpoint in the Eastleigh technical area and the pair will have enjoyed the occasion at a Premier League stadium, capped by a positive performance and a 2-0 win from their players. 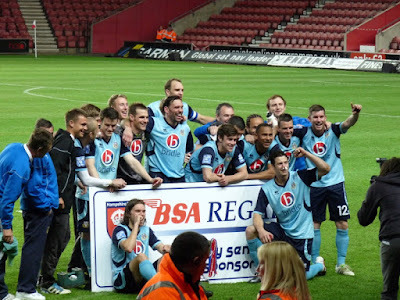 The Spitfires ran out 2-0 winners over AFC Totton in the Hampshire Senior Cup Final at St. Mary's Stadium tonight. Chris Flood opened the scoring in the 11th minute which sponsors man of the match Mitchell Nelson added to in the second half. Eastleigh’s Shaun Wilkinson has confirmed the squad for tomorrow night’s showpiece finale at St Mary’s for the Hampshire FA Senior Cup Final against local rivals AFC Totton. With a good attendance expected and an early 7.30 kick off, Shaun and the team will be doing all they can to prevent Totton securing the Cup for the third year in succession. For those of you who wish to savour the atmosphere early - the Clubhouse will be open from lunchtime and Club Director Steve Brookwell has kindly offered to provide a coach to transport the fans to the ground for free. We look forward to seeing as many people as possible for what we hope to be a very memorable occasion. NEITHER Eastleigh nor AFC Totton will have their usual names at the helm for Wednesday's Hampshire FA Senior Cup final at St Mary's (7.30pm). After leading AFC Totton to glory in the last two seasons, Stuart Ritchie would have been gunning for an impressive hat-trick of county crowns. But having completed the Evo-Stik Southern Premier Division season with the Stags, Ritchie was unveiled as the new manager of Havant & Waterlooville on Tuesday and won't be there to defend the trophy. Eastleigh boss Ian Baird will also be absent, having accepted an invitation to the Hong Kong FC International Soccer Sevens. Baird, who managed the Hong Kong national team in 1999, annually attends the event and had not anticipated Eastleigh being in the HSC final when they were knocked out at the second round stage by Aldershot in October. Eastleigh FC are thrilled to announce the signing of Glen Southam from Dover Athletic this morning as Ian Baird continues to put together his squad for the coming season. Glen is an experienced and talented central midfielder with a wealth of Football League experience including spells at Dagenham and Barnet. Ian is naturally delighted to have signed one of his key summer transfer targets. The Spitfire's manager commented: "Glen is a class midfielder, he has a great pedigree and I am really looking forward to working with him next season and beyond. “He had a number of other offers but has chosen to join Eastleigh ahead of the other clubs and that is terrific news for us. “I am sure he will be a real hit with the fans who will be delighted we have been able to attract a player of his calibre to the club." Eastleigh FC of the Blue Square South will be holding trials for players on Wednesday 6th June 2012. These trials will give players the opportunity to be assessed by our UEFA qualified coaching staff and give them the opportunity of representing Eastleigh FC. Eastleigh has a pedigree for producing Football League players with Brett Williams (Reading FC) and Aaron Martin (Southampton FC) making the grade after impressing at non-league level. In the 2011/12 season we helped young players secure deals with Will Aimson, 17 and Josh Helm, 16 signing contracts with Hull City and Swindon Town. These trials will give players the opportunity to showcase their talents and receive constructive feedback from Ian Baird and the coaching team at the club. Totton's 'Big Earner' signs for Eastleigh! Eastleigh Football Club today unveiled Lucy Richmond as their new Commercial Manager. Lucy will join Mark Jewell and help to turn around the club’s commercial and marketing strategy and thereby maximise the commercial revenues. Having previously worked for AFC Totton, the 32-year-old is described as having a wealth of experience in sales and marketing. “One of the first priorities on taking over the club was the need to develop the whole commercial offering and Lucy’s connection’s in Southampton and Eastleigh has given us a massive head start,” explained Stewart Donald. Lucy can be contacted at the Club on 02380 613361. Eastleigh manager Ian Baird talks to WINOL's Aarran Summers previewing this Wednesday's (16th May, 7:30 k.o.) Hampshire FA Senior Cup Final versus AFC Totton. Eastleigh have secured their second summer signing, bringing in defender Osei Sankofa from Blue Square Bet South rivals Boreham Wood. The 27-year-old former Charlton Athletic player has agreed personal terms and joins the Spitfires on an initial one-year deal. Manager Ian Baird, who signed frontman Marvin Williams from Salisbury City last week, said: “Osei fits the profile of the player we are looking to attract. “He is young, strong, athletic and had a really good season last year at Boreham Wood. “I have kept tabs on him for some time. “He is a player with a good pedigree and I’m pleased to have secured his signature. Six-footer Sankofa, who can play anywhere across the back line, represented England from under-16 to under-20 level. Eastleigh Football Club is delighted to announce securing the signature of Boreham Wood’s Osei Sankofa as Spitfire’s boss Ian Baird continues to do his summer spending early. Defender Sankofa, 27, has agreed personal terms and joins the Spitfires on an initial one year deal. Manager Ian Baird commented: “Osei fits the profile of the player we are looking to attract. He is young, strong, athletic and had a really good season last year at Boreham Wood. I have kept tabs on him for some time, having him watched several times and I watched him myself. He is a player with a good pedigree and I'm pleased to have secured his signature”. Talking about the season ahead, Ian continued: “We are trying to get a good blend of experience and youth and create a really good environment next year where players are judged on merits and form”. Manager Ian Baird has now met with all the players from last season to discuss the plans for our next campaign. He has started his work early to assemble a squad that he feels will be able to challenge for honours next year. Jamie Brown, Richard Gillespie, Ian Herring, Scott Rogers and Ben Wilson (all pictured below) have been released by the club. We would like to thank them all for their efforts over the years and wish them well for the future. The supporters club AGM will take place on Thursday May 31 at the clubhouse in the evening so please make it if you can. We are very keen to get more people involved and if you are interested in being a committee member please e-mail back - efcspitfires@aol.co.uk or send a message to Chris Blake (eastleigh till I die) on the forum and we will be very glad of your input. EASTLEIGH manager Ian Baird has offered a contract to goalkeeper Jack Dovey following his release from Saints. But the 19-year-old, who has been on loan with the Spitfires since October last year, wants to join another pro club. He recently spent three days with Eddie Howe's Burnley and had been due to play a trial game with Yeovil this week before damaging an ankle at Maidenhead last Saturday. "I've told Jack he'd be better off getting games with me rather than playing as a number two elsewhere, but he's got aspirations to be a pro," said Baird. "It's up to him, but I'm extremely impatient and with 650 players due to be released this summer, there will be plenty around." With at least another six signings anticipated at Eastleigh, Baird has already started clearing the decks to make way for new arrivals. EASTLEIGH have started their summer business early, signing striker Marvin Williams from Blue Square Bet South rivals Salisbury. The 24-year-old, who can also play as a wide midfielder, started his career at Millwall and joined Salisbury mid-season from Hemel Hemel Hempstead Town, who were managed at the time by ex-Whites boss Tommy Widdrington. Williams has signed an initial two-year deal for the Spitfires, whose manager Ian Baird said: “Marvin is a player I’ve been tracking for a while and looked very dangerous when we played Salisbury in February “He’s quick, direct and will add good competition for places. After leaving Millwall, Williams played for Yeovil, Brentford and Torquay before making seven appearances for Swedish third division side Ostersunds FK in 2010. Eastleigh Football Club are delighted to confirm the first 2012 summer signing of 24 year old striker Marvin Williams from Blue Square South rivals Salisbury City. Marvin has signed an initial two-year deal having turned down a number of other offers in the process, both from this country and abroad, and will join his new team-mates at the Silverlake for the first day of pre-season training. Spitfire manager Ian Baird commented:”Marvin is a player that I’ve been tracking for a while and looked very dangerous when we played Salisbury back in February. He’s quick, direct and will add good competition for places. He’s still a young lad with bags of potential and hopefully can fulfill that and progress with us”. Arguably the biggest job of the summer has commenced with major developments to the playing surface well underway. Like a number of grounds, the Silverlake is in need of renovation after the rigors of last season’s fixture programme. The club have called in pitch specialists Speedcut Contractors Ltd, who after an initial consultation have commenced works on both the main pitch and the training ground on Lower Hardmoor. Both pitches are in need of Deep Aeration to decompact the soil and improve the drainage. Speedcut have a literally ground-breaking machine that is able to decompact and aerate far deeper than typical equipment. They carried out the same work at Brentford Football Club last year, and having spoken to Brentford's groundsman, they were delighted with the results.